Handwriting Practice Worksheets – Do These Really Help Improve Handwriting? Regardless of whether its manuscript or cursive, one of the biggest problems most people have is with spacing. Most people simply don't know how much space to leave between both words and letters, resulting in cramped or loose words that are difficult to understand. 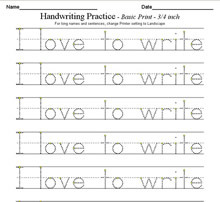 Handwriting practice worksheets are made with the letters already perfectly spaced. When children try to mimic the letters and/or words, they end up learning how to properly space their letters and words. Once practice becomes habit, their handwriting will be well-spaced and legible for years. A major reason the handwriting of most people isn't clear is because the writing is either too small or too large. For some, it's a mix of both. As a result, some letters are harder to read than others, making reading a tedious task. For a student giving an exam, it could mean the difference between passing and failing. Handwriting practice worksheets are pre-lined, ensuring that children know just how tall or short letters should be. This helps them understand how to move their writing utensil and how large or small to make their stroke. Handwriting practice worksheets help ensure their handwriting is large enough to be read easily yet small enough to not appear like headlines and/or waste paper. When children move from manuscript to cursive writing, one of the first things they learn is just how much to curve a letter and at what approximate angle. Without handwriting practice worksheets, children will use continue to use their manuscript form and 'try' to adapt the curves accordingly. As a result, either their writing becomes difficult to read or they are unable to write cursively. Many handwriting practice worksheets have letters a child simply needs to trace. This helps them form their curves properly and master cursive writing as they did manuscript. As such, handwriting practice worksheets teach children how to properly form their curves. Whether it's their teacher or parent, children need guidance throughout their life, usually to grasp the basics of handwriting. Teachers show children how to grip their pens, move their wrists, make proper strokes but most of what they teach is theoretical. To gain practical experience, children require a proper guide. When it comes to practicing, nothing works better than handwriting practice worksheets. With letters properly printed and space given to write, they work as a proper writing guide for children, showing them how their writing should be like. It allows them to trace and mimic writing and practice what their teachers impart. Most importantly, they work as a guide for children when their teachers cannot be reached. More than improving their handwriting, handwriting practice worksheets work to make children more independent as well, teaching them to increasingly believe in their handwriting. This instills confidence and, done well, works to further improve their handwriting. With their simple lines, easily traced letters and plenty of space, it seems handwriting practice worksheets actually do help improve handwriting. Whether its manuscript or cursive, they ensure proper grip, spacing and letter height. Given to kids at different grades, it ensures they write quickly and clearly. For more information on handwriting practice worksheets and how they help improve handwriting, visit www.masterhandwriting.com.